Download a PDF of the essay here. Journalists are supposed to be impartial, but they rarely really are. We gather information and then decide which bits to present to our audience and in what order to present them. It’s by definition a manipulative process. That said, the serious journalist strives for balance and tries to present the audience with both sides of a story in order to allow the audience to decide which side it is on (or, at least, to lead the audience to the journalist’s desired conclusion without making it feel overly manipulated). Occasionally, though, journalists encounter a story where the moral argument seems so heavily weighted on one side that it is difficult to give both sides a fair shake. The story of Rosia Montana is one such case. Gabriel Resources is a gold mining company listed on the Toronto Stock Exchange with a market capitalization of more than $600 million — down from over $1 billion at its peak. Its sole reason for being is to carve out what would be Europe’s largest open-pit gold mine, obliterating the Romanian town of Rosia Montana in the process. A handful of Romanian villagers and farmers want to stop it. How do you achieve balance between poor people attached to their land on one side and, on the other, sophisticated outsiders who would destroy that land for — let’s face it — simple greed? Gold is not in short supply, nor are its industrial applications particularly important or of particular benefit to mankind. Aside from diamonds, it’s one of the most frivolous commodities that man digs out of the ground. But let’s try to give some balance nonetheless. 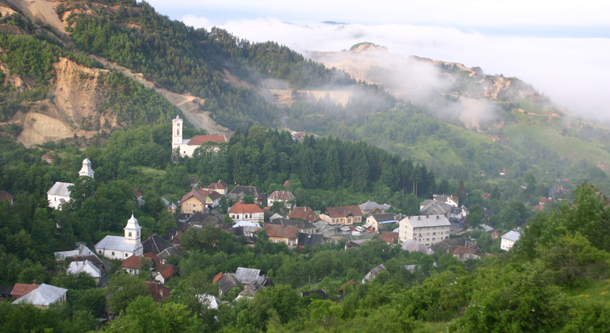 First, Rosia Montana was always a mining town. Gold has mined from the surrounding hills since before Roman times right up until two years ago. Open pit mining was introduced in the 1970s. It stopped because the rich lodes of ore had been exhausted and only capital-intensive large scale mining can make it profitable again. Today, Rosia Montana is a dying town, a cluster of crumbling buildings and rutted roads at the end of a valley deep in Transylvania. The oft proffered notion that tourism could revive it is a fiction. As mining towns go, it is only marginally charming and barely picturesque. It is a hardscrabble place whose most promising youths are drifting away, leaving behind a shrinking population of elderly residents and their least educated offspring. Pollution has long been a problem there. The hills are honeycombed with ancient mines, and the top of one has been cut away, leaving an ugly open pit. Water leaches through the old mines and spills out in a toxic, rust-colored slurry of heavy metals that rushes downstream into the Danube. The town’s name, which means Red Mountain, comes as much from this runoff as it does from the color of the ore hidden in the ground. Meanwhile, Romania is a relatively poor country, still struggling to meet the basic needs of its people nearly two decades after the collapse of a pernicious Communist regime. It has natural resources, but not the money or expertise to develop them fully. Given those parameters, and given the soaring price of gold, one could easily argue that the best thing for Rosia Montana would be to invite international mining experts in to revive its abandoned mine. Investment would pour into the valley and the town’s youth would find jobs. The area would be transformed, even reborn. That is what the people behind Gabriel Resources want to do and that is what many of Rosia Montana’s residents want to do. But they are opposed by a small group of local landowners, backed by a well-connected Swiss-born French activist who has rallied the international environmental movement to their cause. Gabriel Resources was founded in the wake of Communism’s collapse by Romanian businessmen with little mining experience and suspected ties to the former secret police. They won a vast concession to exploit mineral deposits in Transylvania. That deal, itself, is clouded in controversy. The businessmen named their fledgling venture Gabriel, after a relative of one, and listed it on the speculative Vancouver stock exchange, giving it the gloss of a Canadian company. Their initial approaches to local landowners were heavy handed and, in reaction, some of the landowners formed an association called Alburnus Maior — Rosia Montana’s Roman name — to try to stop the project. They were engaged in an ineffective letter-writing campaign when the founders of Gabriel Resources moved the company’s listing from Vancouver, British Columbia, to the more respectable Toronto Stock Exchange. The opposition might have withered had it not been for an unrelated plan to build a Dracula theme park near the picturesque Romanian town of Sighisoara, once home to Vlad Dracula, the notorious Romanian ruler and inspiration for ”Dracula,” the Bram Stoker novel. 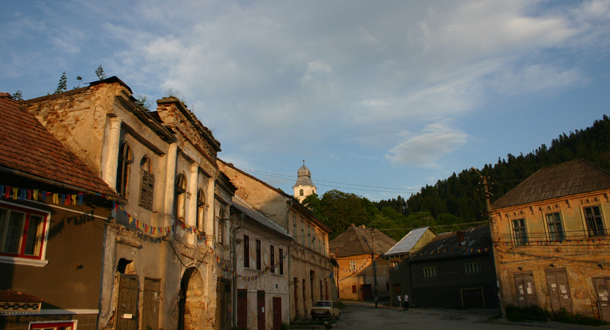 The plan outraged Prince Charles of Britain, who is fond of Romania’s old Saxon villages, of which Sighisoara is one. It also outraged Teddy Goldsmith, the aging anti-globalist environmentalist and scion of a wealthy business family. A journalist who wrote for Mr. Goldsmith’s environmentalist magazine, The Ecologist, moved to Romania to help defeat the project. With such powerful forces aligned against it, the proposed Sighisoara theme park died. While in Romania, the journalist, who was born in Switzerland but carries a French passport, heard about the Gabriel Resources’ plan for Rosia Montana and went to meet its opponents. Within months, she had introduced them to some of the most powerful environmental organizations in the world. Gabriel Resources, meanwhile, was taken over by professionals and is now run by savvy and experienced mining men, many of whom cut their teeth building Barrick Gold Corp., one of the largest gold mining companies in the world. From the mining company’s point of view and from the point of view of those residents who support the project and all of the economic benefits it might bring, the opponents are risking the greater good for their own self interest. The multi-billion-dollar project would extract an estimated 300 tons of gold and 1,200 tons of silver from the earth and would plow billions of dollars into the Romanian economy. It could earn Gabriel Resources and its shareholders billions more in profit. The Rosia Montana project only represents about half of the mineral rights won by the original Romanian businessmen. The investors in those rights are waiting patiently to see if the Rosia Montana projects proceeds, opening the door for even more large-scale open-pit mining in the area. Of course, as with any sizeable investment, business and environmental considerations have become infused with politics on local, national and even supra-national levels. Gabriel Mining has been aggressive in recruiting local political support by employing city officials or handing jobs out to their family members. The debate has been more complex nationally, where politicians are mindful of the increased international scrutiny brought by the country’s recent membership in the European Union. Late last year, a regional court annulled an archeological permit that would have allowed Gabriel Mining to destroy vestiges of Roman activity in the area. More critically, the company has suspended much of its work while fighting in the courts with Romania’s Environmental Ministry, which has suspended its review of Gabriel Mining’s environmental impact study, a necessary step in starting the project. 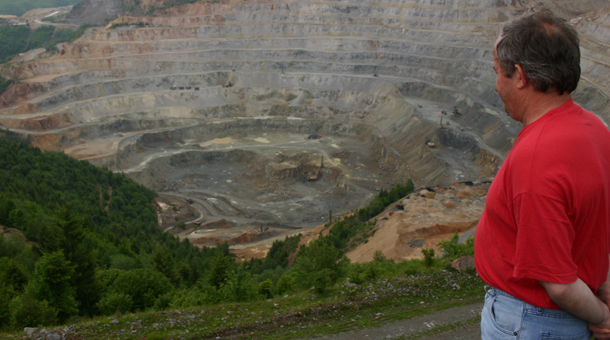 As part of their campaign to win over public opinion, Gabriel Resources financed a documentary called Mine Your Own Business, arguing that the Rosia Montana controversy is an example of affluent, sentimental environmentalists preventing the world’s poor from developing economically. But, economics aside, it is difficult to champion a mining company against people who care about Mother Earth. Mining is one of the world’s most unpopular industries these days, particularly the kind that leaves the earth permanently scarred with moonscape-like craters a mile or more wide. The Rosia Montana project would gouge out several hills, leaving four yawning pits in their place, and slowly fill an entire valley with wastewater and tailings that would take years to solidify. Still more worrying is Gabriel Resources’ planned use of large quantities of highly toxic cyanide to separate gold and silver from the ore. Memories in the region are still fresh of an accident at another gold mine 80 miles north of Rosia Montana in which a dam holding back a cyanide-laced lake burst in 2000, contaminating water for hundreds of miles downstream, deep into Hungary. Gabriel Resources says it would build in safeguards that were missing at that mine. It also promises to clean up pollution left by past mining operations and do as much as possible to repair the altered landscape after its project is done. But mining companies always make promises and accidents still happen. WIDE ANGLE’s Gold Futures, in fact, is a reflection of those fears. While WIDE ANGLE’s editors have worked hard to produce a balanced account, it is based on a documentary, New Eldorado. Gold. The Curse of Rosia Montana, by a Hungarian environmentalist filmmaker with financing that came, in part from Hungary’s Ministry of Environment and Water Conservancy and the Budapest waterworks. Gabriel Resources is what is called a “junior company” in the mining trade. 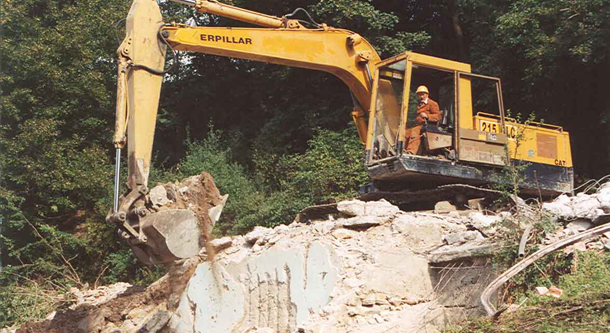 It does not have the money, people or equipment needed to carry out the Rosia Montana project. That is the job of “senior companies,” like Newmont Mining, which holds a 20 percent stake in Gabriel Resources. It is possible that Gabriel Resources would become a senior company were the project to win all of the approvals necessary to proceed. But it is more likely that the company would sell the project to an established senior company. At that point, all of the promises that Gabriel has made would pass to someone else to fulfill. Craig S. Smith is a journalist who covered Rosia Montana’s gold mine in the article “Fighting Over Gold in the Land of Dracula,” published in the New York Times in 2007.